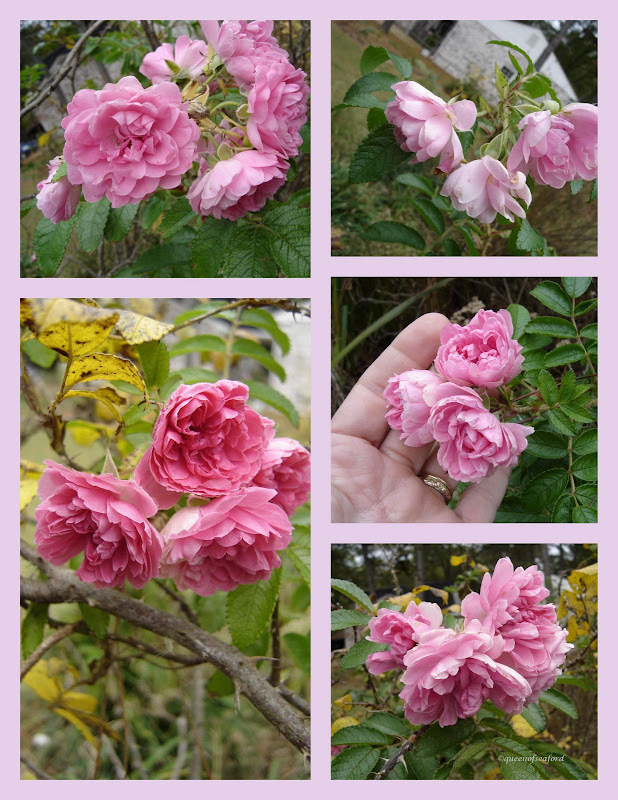 The end of October and there are still so many blooms in my garden... This Rugosa Rose has been blooming all season long. 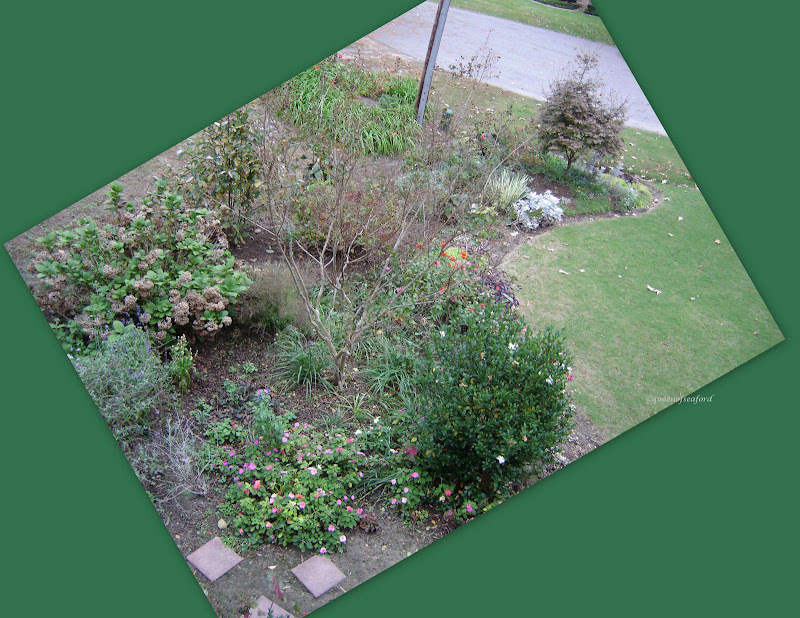 A couple weeks ago there were some pictures of gardens 'from above'. It certainly gives a different perspective. 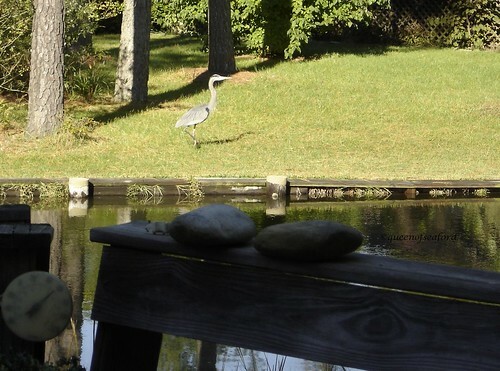 Here is my front yard. If you look closely, I have drawn a line at the property line. 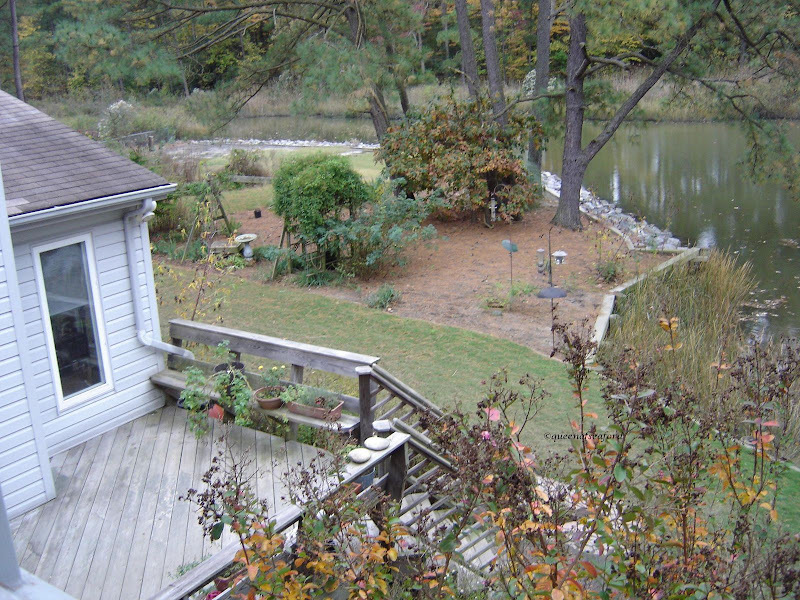 And part of the backyard. Finally....the Hibiscus opened on Thursday....another great performer. The first time I saw a Winged Elm we were on our property in South Carolina and there were lots of small saplings sprouting up. Again it was our landscaper who told me about this tree. I have come a long way in the course of a year. It seems taking one tree at a time is the way for me to learn about trees. This fast growing native tree is adaptable to a wide range of growing conditions, zones 6- 9, part shade to part sun, drought tolerant, moderate salt tolerance, bottomland or terraces. 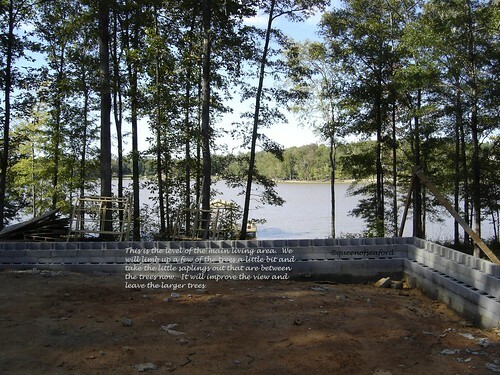 The average height is about 45 feet with a similar spread. There have been some specimens reaching up to 100 feet tall. The growth pattern is that of an upright vase, spreading as it matures. The most distinctive feature of the Winged Elm is the corky wings that protrude along the stems. These wings vary from tree to tree. The leaves are doubly serrated, elliptical, pinnate venation, and appear alternately along the stem. The margins between the nodes are small. The green leaves turn yellow in the fall, one website claims it to be showy color and another says it is dull. Eventually I will get a photo of the fall color and we can decide! The flowers are not showy, appearing in the fall. 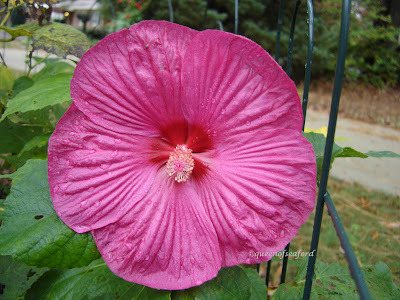 It is a perfect flower, having both male and female reproductive structures. Seed germination is high and it has been known to invade open meadows. Deer find the stems and leaves nutritious and succulent in the spring when other food is less available. Later in the season the leaves are less digestible. 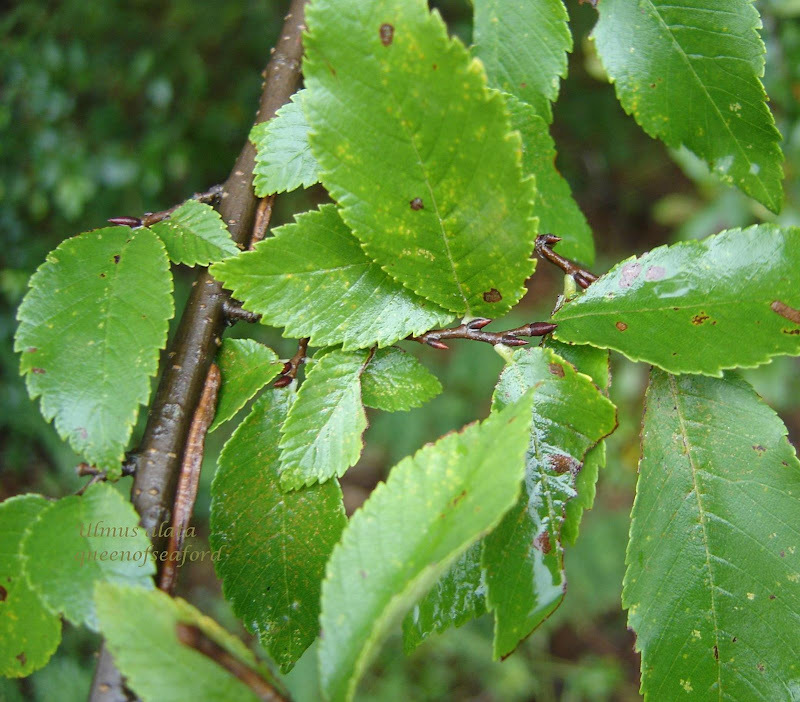 Dutch Elm disease is a concern with this tree. 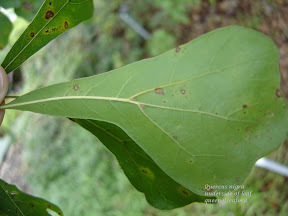 Other pest issues are scale, mites and powdery mildew. Fun facts- The Creek Indian call this tree the Wahoo. Because it resists splitting, it is used in making high quality hockey sticks. Other uses for this hard wood include furniture, flooring, boxes and crates. Great Fishing , a WOW and an Oh No! Sitting at my computer I can look out the door and see the water. 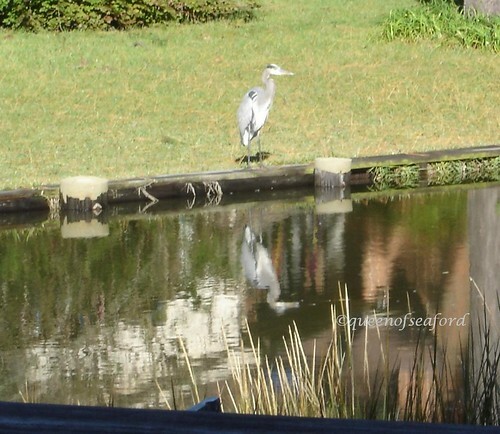 On Monday this Great Blue Heron had the morning sun hitting him. It made him look as though he was glowing. He didn't want me outside and started walking away. 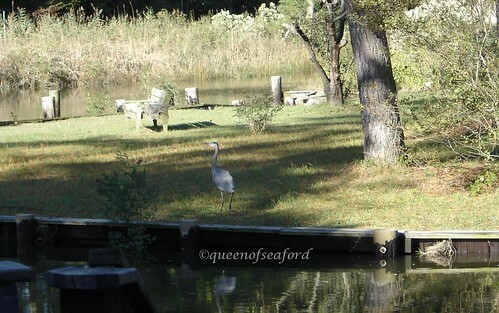 He finally walked back over to the bulkhead to continue fishing. A few more of these photos on my Flickr page. Wednesday I went to Fort Monroe to take some photos for a future post. As I climbed the seawall I saw 5 dolphins jump out of the water. Of course the camera was not focused on the water at the time. If you look in the center there are about three fins that you can see. 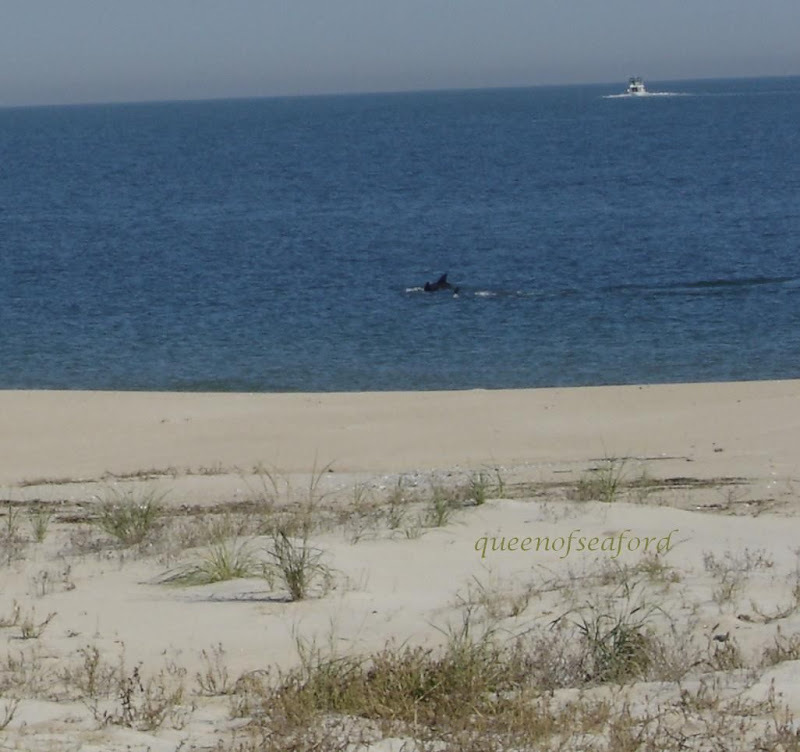 What a treat to watch the group of them swim along the shoreline. 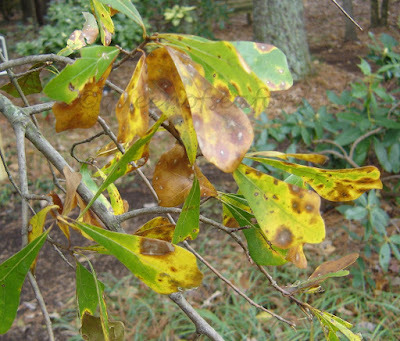 This oak is commonly found in the bottomlands or swampy areas. It goes by other names, including possum oak and spotted oak. 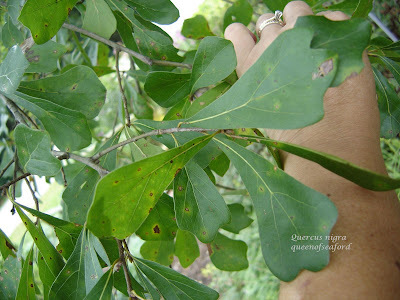 The Water Oak is monoecious – staminate flowers, catkins form on previous year's growth and the pistillate blooms on current season's growth. 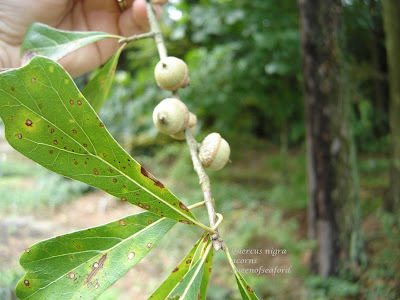 The acorn forms as a scab the first year and matures the second. It takes about 20 years for the tree to produce its fruit. 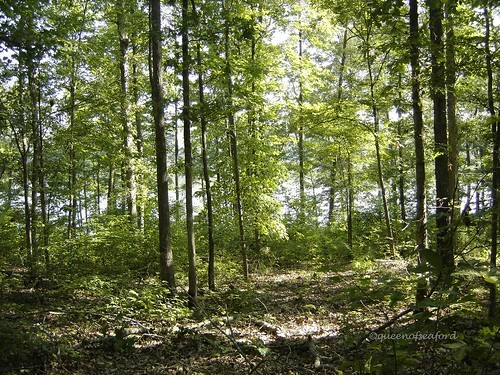 A mature tree can reach heights of 120+ feet and has a spread of about 50- 60 feet. It is a fast growing tree. 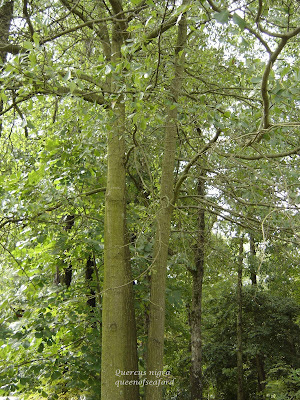 The Water Oak is a shorted lived tree, 60- 80 compared to other oaks, 100-600+years. It has been used in the timber industry as well as for firewood. Planted widely in the south for its shade. 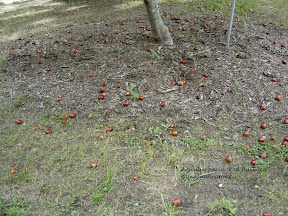 The acorns are eaten by squirrels and other wildlife. It is a native tree and it ranges from zones 6-10. The leaves are spatulate to lanceolate and having 0- 5 lobes. 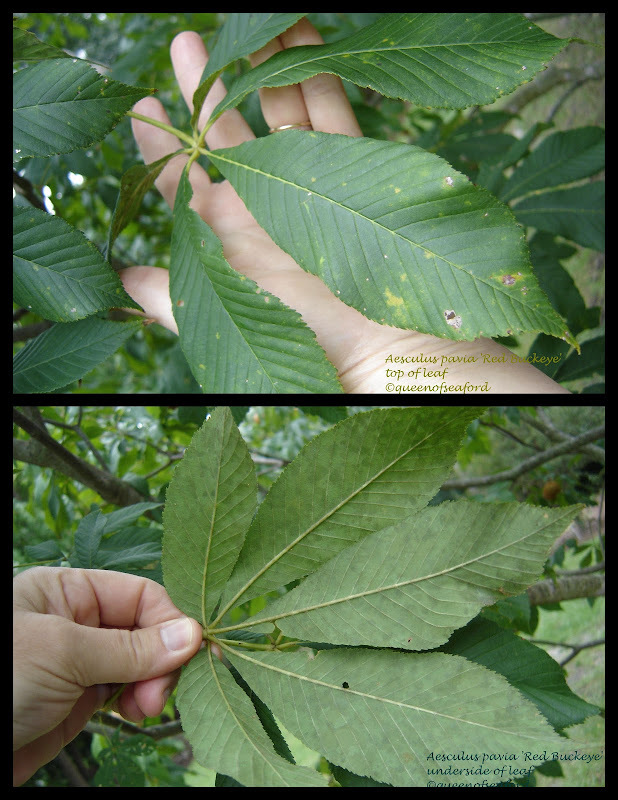 When I first saw this tree and its unusual leaf I was in South Carolina on our property. I asked our landscaper what kind of tree it was. He said it was a Water Oak and that it has 'spoon shaped leaves'. Great way to remember that- thanks Wyatt! The bark is dark and smooth on younger trees and develops ridges as it ages. The fall leaf color is yellow and quite showy. 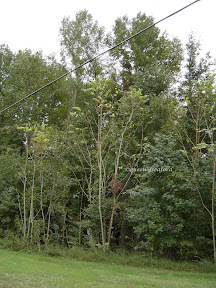 Once our trees start turning I will add the fall photos to each posting. Be sure to check back to previous posts. Here are some of the resources I used for this article. 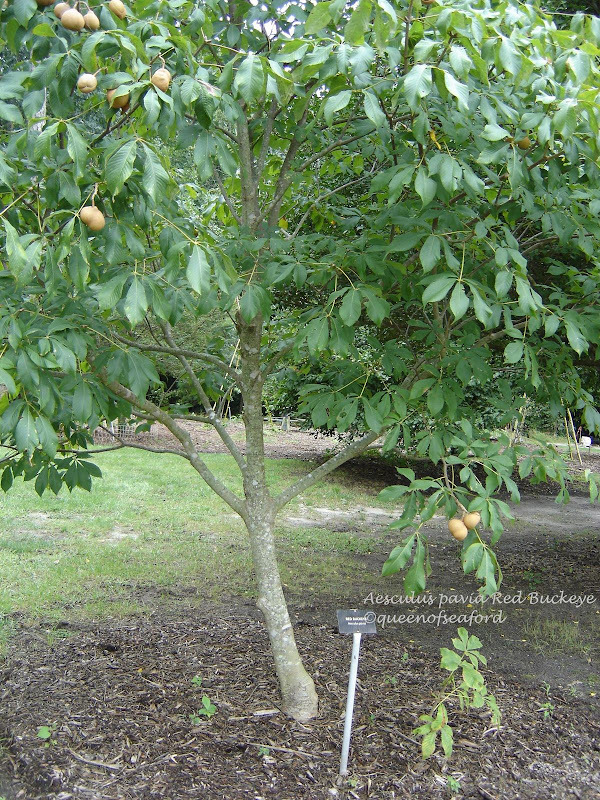 University of Florida 4-H –single page with photos and short bits of information on all characteristics of tree. This past August I traveled up and down interstate 95 and interstate 85 from DC to South Carolina and points in between. I made two trips to DC to help one daughter move into her apartment. Early in month I drove to North Carolina to help the other daughter move into her place. Along the highways I saw all sorts of interesting foliage. Trying to make an ID while driving 65+mph isn’t easy. The trip to South Carolina I didn’t drive, so I took the opportunity to look out the windows to try and figure out what plants were along the highway. I thought that one of the plants was Sumac, Rhus glabra. 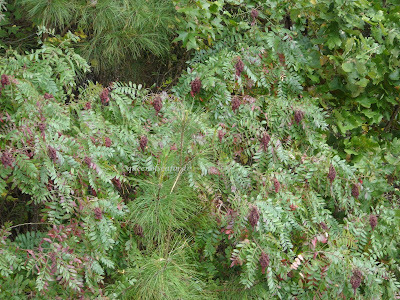 Seemed there was a lot of Sumac growing along the road. 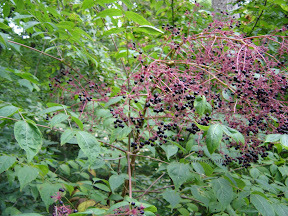 Some of the plants had a flower or berries at the top. 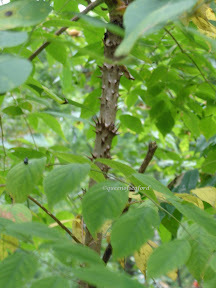 I finally figured out that must be Devil’s Walking Stick, Aralia spinosa. Both of these shrubs/trees are native to the United States. Both also form thickets of growth. I was not sure that ALL that I was seeing was in fact one or the other. Again, going down the highway is not the most effective way to make a plant ID. Fast forward to our trip this month back to South Carolina, another opportunity to look at trees and shrubs along the drive. As we left I thought I forgot the book I was reading. Looking around the car I found a book one of my fellow Master Gardeners gave me titled Nonnative Invasive Plants of Southern Forests. I flipped through the book as we drove along. 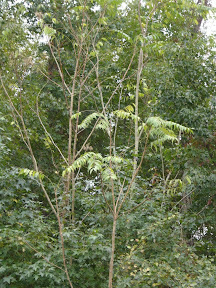 Lo and behold, the plant of which I was trying to make identification turned out to be Tree-of-Heaven, Ailanthus altissima, an invasive nonnative. 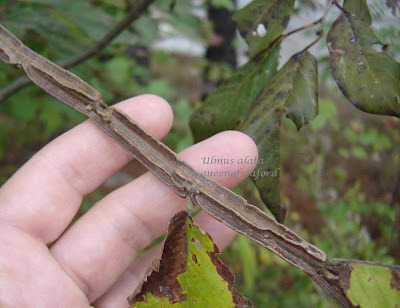 The leave pattern is pinnately compound –very similar to both Sumac and Devil’s Walking Stick. One of the key identifiers was the autumn color. 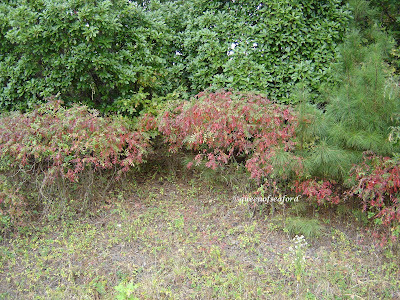 Sumac turns a beautiful bronze red color as does the Devil’s Walking Stick. The Tree-of-Heaven….pale yellow. I was amazed at the thick groves of this invasive. see how tall it gets? Continuing down the highway with book in hand I realized another invasive plant that is also within the National Park…Golden Bamboo, Phyliostachys aurea. 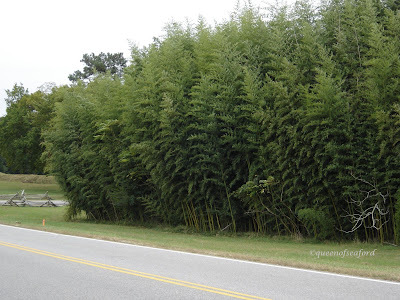 It was planted as an ornamental years ago and used for fishing poles, now, it is crowding out cemeteries and homesteads as well as in ditches along the highway. As I looked through the book there were a few more of these thugs from the book along the highway. 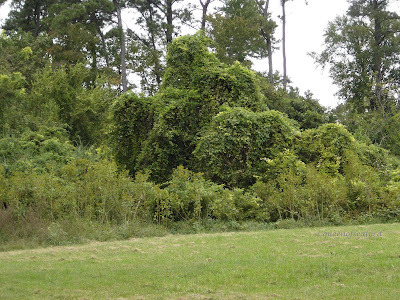 Kudzu, Pueraria montana --we all know what it looks like. It covers everything in its wake. 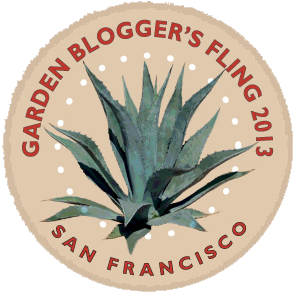 Skeeter did a great posting on it about a month ago at In The Garden. My photo is from the Yorktown Battlefield. 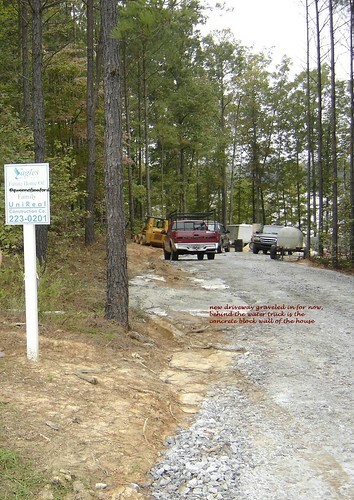 Our National Parks are being encroached upon by this and other invasives. What a nightmare these plants have become. 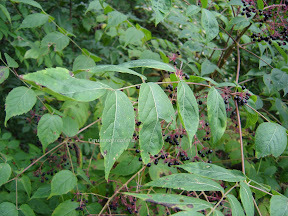 Last week Debbie at Garden Thyme with the Creative Gardener wrote a great piece on other invasives. I read her posting after I got back from my trip and had decided to write something myself. There are so many plants out there that should not have been planted and now they are spreading by rhizomes, by seeds from birds or animals, by seeds on the wind…it can make a person mad! There are so many plants that have been planted by the various highway departments that were used for erosion control or ornamental displays at the interchanges. You and I know many of them; we use them in our gardens. Winged Burning Bush (Euonymus alata), Chinese Silvergrass(Miscanthus sinensis), Honeysuckle (Lonicera japonica), Heavenly Bamboo (Nandina domestica) English Ivy (Hedera helix), and I could go on and on. 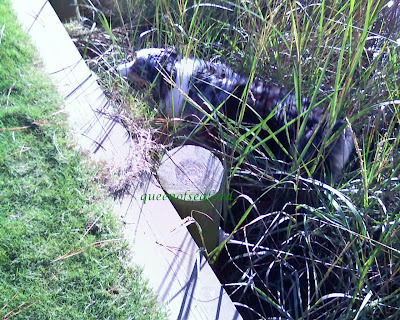 I have listed some wonderful websites where you can go and find what is classified as an invasive in your area. 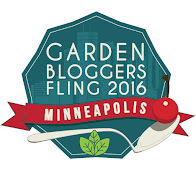 There are some Miscanthus and Nandina that have sterile seeded cultivars, be an informed gardener. Can you control the wind as it carries a seed? Will you make the birds promise not to eat and deposit the seeds away from where you can manage them? Before you buy –do your homework! Know what you are buying. Look at natives or sterile varieties. If you have something that is ‘taking over’ perhaps it is next year’s newest member to the list of invasive plants. 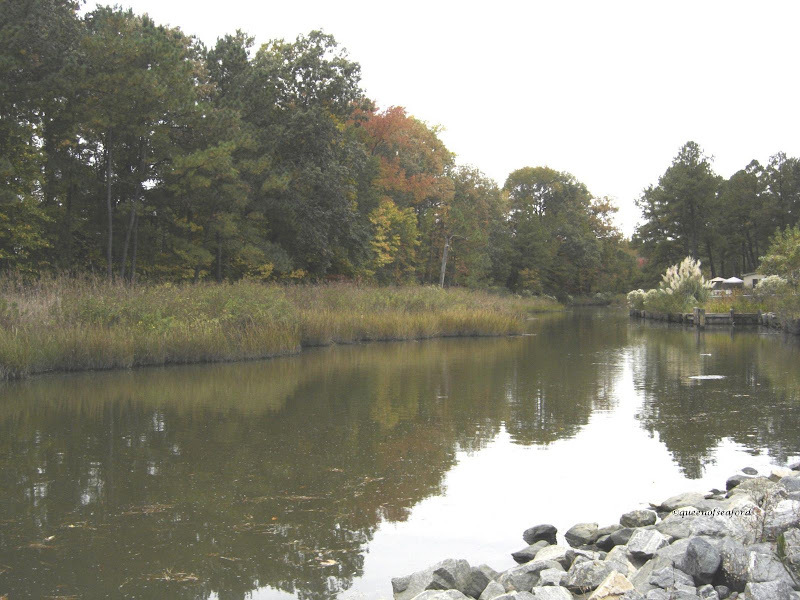 National Arboretum web list about classification of invasives. USDA website with a listing that links to photos and information on specific plants. As I couldn’t take lots of photos as we drove along the highway, please check out this site. 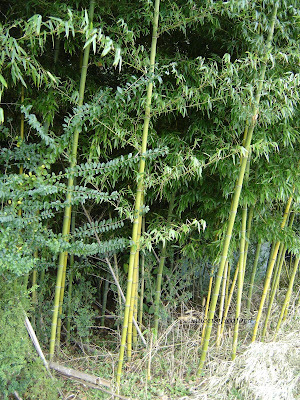 Golden Bamboo is covering our battlefield. 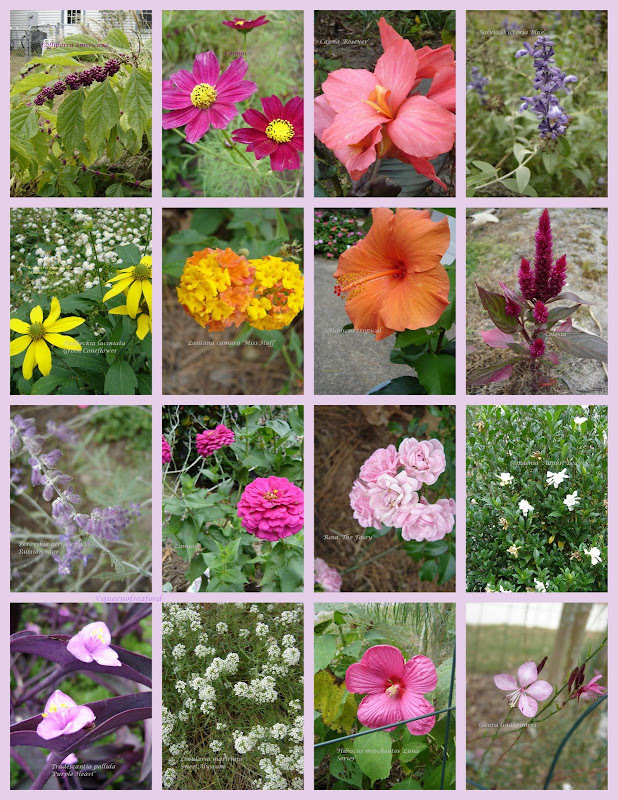 I have been playing with both Flickr and Picasa for my photo postings. Grace had asked me for help on posting larger photos... yes, oh the possibilities! Doing this collage for Garden Blogger Bloom Day I wanted the photo to be large enough to see the labels I put on each flower. When I first started blogging my sister recommended I use a trial blog to explore photo and text layout. Thanks K.!! It is nice to be able to see what the posting will look like before you send it out over the internet. Just make sure you use the same template on both blogs and same font, etc. ANYHOW---- while trial blogging the different sizes I thought it might be a good example of how different the two photo websites can be. I like them both, but you can see large is not the same for both. 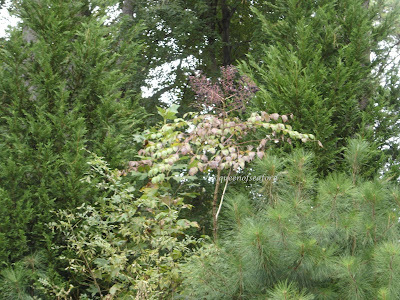 This small tree is a nice one to have in your landscape. It is a native to the United States and the range varies with the website you read—but it is hardy from zones 4 (5) - 8 (9). It can handle shade to full sun, though in full sun it seems to be stressed a bit in our area and loses its leaves earlier than one in a part sun to full shade environment. 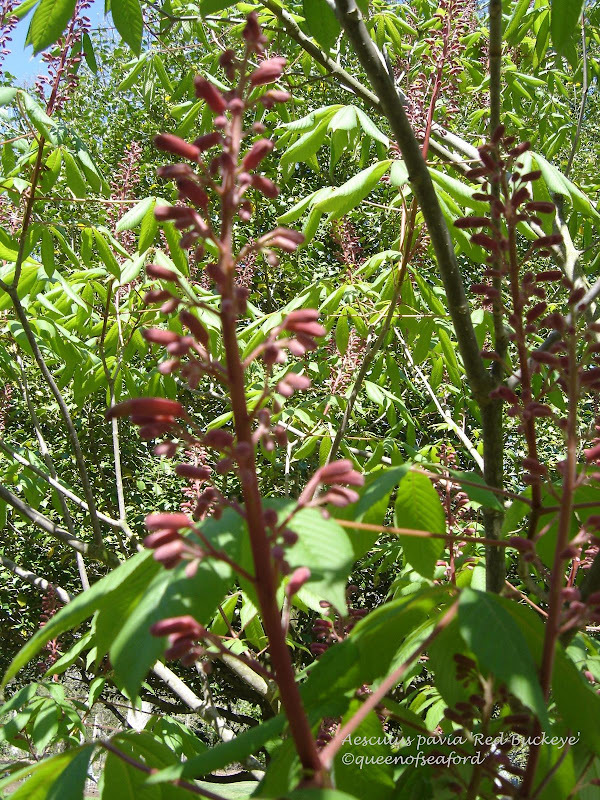 In the spring red panicles of flowers appear –this picture was taken in our Learning Garden in mid-April. The hummingbirds love this red tubular flower – a bonus as mid-April is about when we start seeing the hummingbirds in our area. The tree is a small sized tree. Average height is between 8- 10 feet tall and a 10 foot spread. In some cases there are examples where it has grown to 30 feet tall. The palmatedly compound leaves are rather large with 5-7 leaflets with serrated margins. While fall color is rather insignificant, autumn brings the fruit of the blooms—the nut. 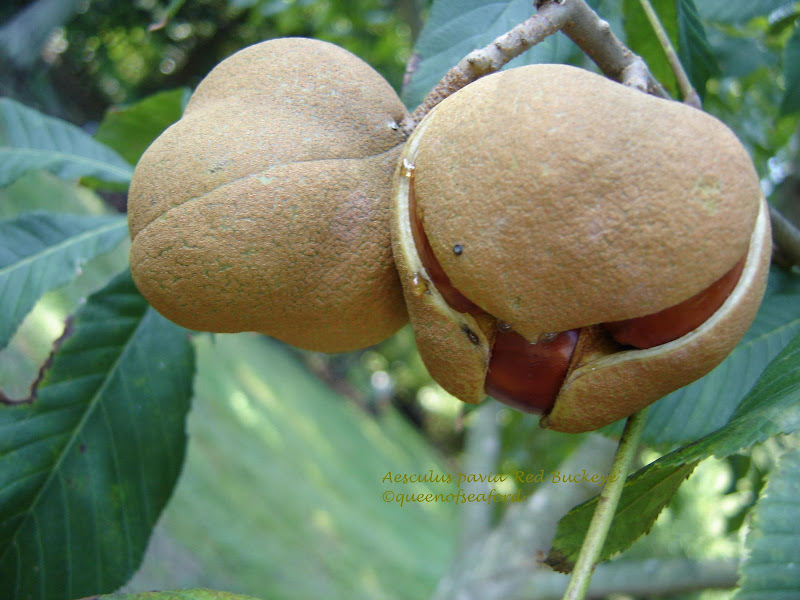 This buckeye resembles the chestnut but it is NOT EDIBLE! Squirrels like this nut and will bury it in various places throughout the garden. 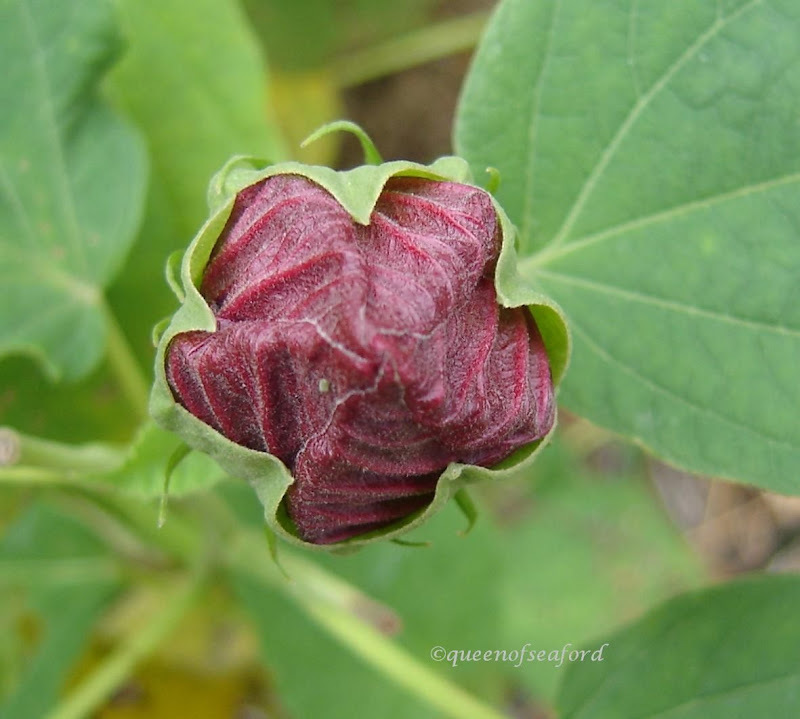 The seed is ready to germinate as soon as it has ripened. A fast growing plant is has been known to bloom within a few years of planting. As you can see the pods have opened and the ground under the tree is littered with the possibility of trees to come. Nice information and additional photos on the following websites. 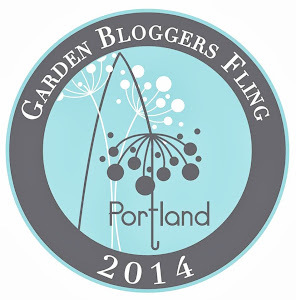 Floridata, Lady Bird Johnson Wildflower Center, Missouri Botanical Garden,and NC State. I have changed my comment parameters so my friends at Wordpress are able to comment. Thanks Pam! 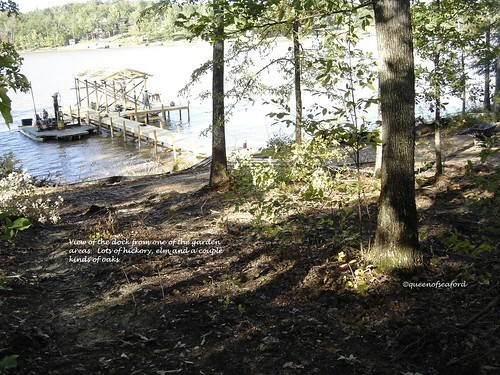 Standing where we thought the house would be sighted and then standing at the front of the garage looking to the lake. If you look to the center of the photos there is a tree that is leaning a little to the right. It is an oak, you don't see it in person like you do when you look at the photos, kind of funny. I have posted these on my Flickr page so you can open them larger. In addition to the photos posted there is an attempt to show a panoramic view collage. A couple of the photos would not line up perfectly, but it is close. The collage is too wide to post here, so check it out on Flickr. 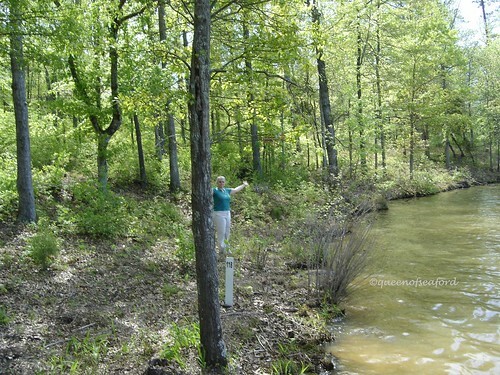 Here I am at the water in April, you will notice how much higher the water is in this photo. 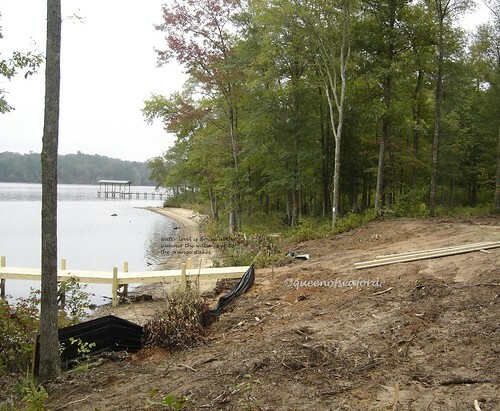 The next photo is from the other side of the lot showing the area where we will have rip-rap installed. See how much lower the water is? At least we have a sandy 'beach'. 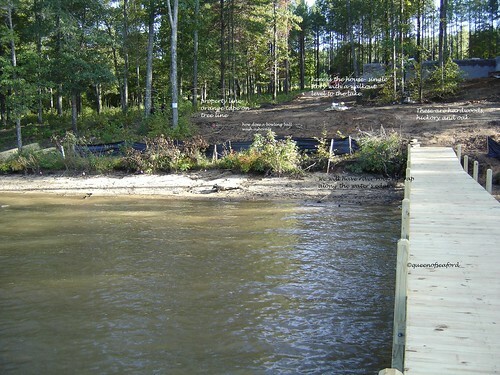 The vegetation at the water's edge was not good, some had rotted and some had some beaver damage that would cause issues later. 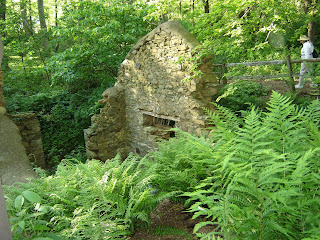 It is a delicate balance to leave the good and clean up the undergrowth and damaged. 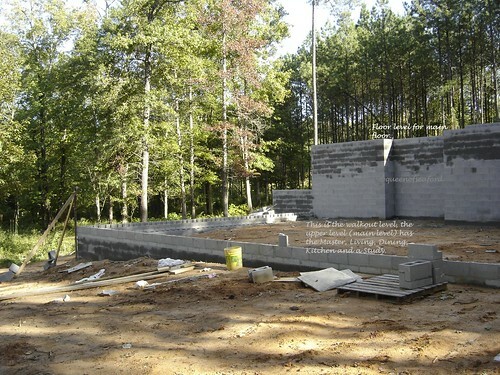 Last, here is a picture of the 'house'. The cinderblocks are wet because they were just filled with concrete. Stay tuned for future updates as we make our trekk back and forth. 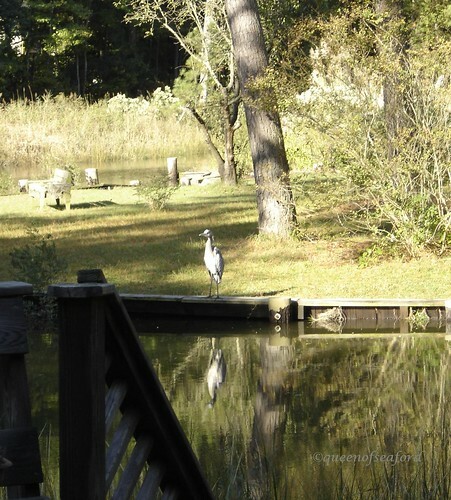 Our new neighbors have offered to take some pictures, so perhaps I will have some to share in between our trips.